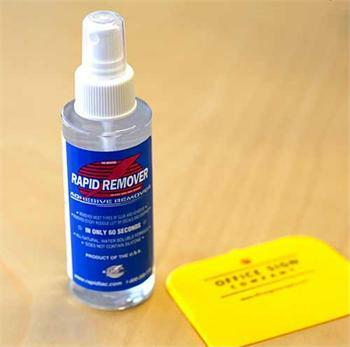 4 oz spray bottle of Rapid Remover to assist your next vinyl sign project. When your faced with removing adhesive we have your solution. Rapid Remover is a non-toxic, water-soluble adhesive remover that breaks down and removes adhesives in as little as sixty seconds! Spray it on, wait a few minutes and easily wipe away residue adhesive with a plastic squeegee and paper towel - Squeegee and 4-ounce bottle included. Not only is does Rapid Remover work fast, but it works without causing damage to most painted or bare metal surfaces. For a fast, clean and non-damaging removal. Gone are the days of using dangerous and risky chemicals that often damaged painted surfaces, and had numerous health hazards. Rapid Remover works. Its that simple. 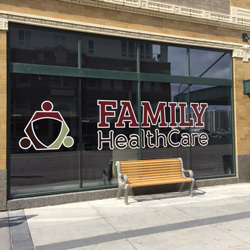 Contour cut vinyl lettering - frosted vinyl and colored vinyl - we have virtually any color vinyl available for your windows, doors and offices. Vinyl lettering available in any size, shape or color. Full color vinyl decals and vinyl door signs. Vinyl stickers available in virtually any size, shape and color. Custom sizes available on request. Contour cut adhesive backed vinyl graphics, cut to any shape for office doors, windows and walls. 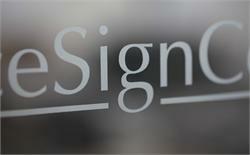 Vinyl lettering for office doors, office windows and more. Photos display frosted window vinyl, but we have virtually any color vinyl available for your windows and offices. Call for quote, quantity discounts available. (701) 526-3835. Frosted glass logo.